MICHIGAN ANIMAL ADOPTION NETWORK ANNOUNCES AN OPEN HOUSE WITH THE RUSSIAN DOG WIZARD! May 14, 2008, Detroit, MI – The Michigan Animal Adoption Network (MAAN) announces a special open house this Saturday, May 17th. 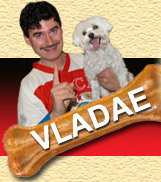 Vladae Roytapel, also known as “The Russian Dog Wizard”, will be the special guest at Pet Supplies Plus in Clinton Twp. Roytapel is the owner of Alternative Canine Training. He has been featured on CNN, ABC, CBS, Fox, NBC and XM Satellite Radio. Common problems with dogs include: barking, pulling on walks, chewing owners’ belongings, digging in the backyard, growling or even biting. “The Russian Dog Wizard” has many solutions to these and other canine issues. This event is open to dogs and their owners. For more information, please contact Chris Wisswell at 248-545-5055 or via e-mail at: info@mi-aan.org. Founded in 1994, the Michigan Animal Adoption Network, is a 501(c)3 non-profit organization for animal rescue in the Metro Detroit area. MAAN frequently engages in special promotions and fundraising efforts. MAAN is continually strives for new and different ways to educate the public, to raise money to continue its rescue efforts, and to find loving homes for homeless pets. To date MAAN has placed more than 4,000 animals through the Adopt-A-Pet program.